This is part fifteen of a series of posts that will examine the Republican delegate allocation rules by state. The main goal of this exercise is to assess the rules for 2016 -- especially relative to 2012 -- in order to gauge the potential impact the changes to the rules along the winner-take-all/proportionality spectrum may have on the race for the Republican nomination. For this cycle the RNC recalibrated its rules, cutting the proportionality window in half (March 1-14), but tightening its definition of proportionality as well. While those alterations will trigger subtle changes in reaction at the state level, other rules changes -- particularly the new binding requirement placed on state parties -- will be more noticeable. The Nevada Republican Party method of delegate allocation for 2016 does not really seem to be that much of a departure from what the party used four years ago. It isn't. Silver state Republicans will once again select delegates to the national convention in a caucus/convention system and will proportionally allocate those delegates to candidates based on a preference poll taken at precinct caucuses across the state on Tuesday, February 23. In reality, nothing is ever actually as easy as that in Nevada. The delegate selection process for Silver state Republicans has been riddled with problems since they were reluctantly added to the carve-out state line-up for the 2008 cycle.2 In that first cycle in 2008, a rift between the state party and delegates aligned with Ron Paul forced the early adjournment of the state convention. Four years later, counting problems plagued the precinct caucuses overwhelmingly won by Mitt Romney and the state convention saw Ron Paul delegates elected to what had been assumed throughout primary season 2012 to be Romney delegate slots. Technically, there is no official threshold to qualify for any of the proportionally allocated delegates from Nevada. But the language of rules matters. Chapter 3, Section 1.0 of the Nevada Republican Party delegate rules sets the parameters here. To win any delegates a candidate must receive at least the percentage of the vote statewide required to qualify for one delegate. While the RNC recognizes Nevada as a state operating without a threshold for delegates, functionally, a candidate must win at least 3.33% of the vote to receive one of the 30 delegates available from the state. Note that FHQ has left those totals unrounded. That is due to the rounding scheme the Nevada Republican Party is utilizing; a largest remainder method. All that means is that there is a particular sequence to the rounding. First, those candidates who do not qualify for delegates are removed from consideration. Everyone below 3.33% of the statewide vote fits that category. Given the language of the rule, then, Paul, Christie, Pataki and Kasich do not qualify and cannot round up to one delegate. Rather than starting with the top votegetter and working down the list until all of the available delegates have been allocated, the largest remainder method first allocates the baseline integer number of delegates to their respective candidates. Trump would receive 11 delegates, Carson 6, Fiorina 2 and so on. That would allocate 24 of the 30 Nevada delegates, leaving six unallocated before rounding. In the second part of the largest remainder method of rounding, the candidates are arranged/ordered according to the fraction they have left over. That would place Bush -- with .8 -- first in line followed by Carson, Trump, Fiorina and on down to Rubio who has a remainder of just .1. Bush, then, would round up to two delegates, and then each subsequent candidate in the order would be rounded up until all of the remaining unallocated delegates are allocated. The above is essentially the reserving of delegate slots for particular candidates. Actual delegate candidates will be elected to fill those slots at the Nevada state convention. This is in line with how Nevada Republicans have conducted the process in the past. However, for 2016, the rules are a bit more specific in terms of how delegates are bound to candidates. Let's say that Trump wins Nevada with 38% of the vote as was assumed in the hypothetical delegate allocation above. Yet, Carson, like Ron Paul before him, overruns the caucus/convention process and additionally corners the market on delegates who are elected/selected to attend the state convention and are thus eligible to be national convention delegates. An overwhelming number of Carson-aligned state convention delegates would all vote for each other and win all or most of the national convention spots. 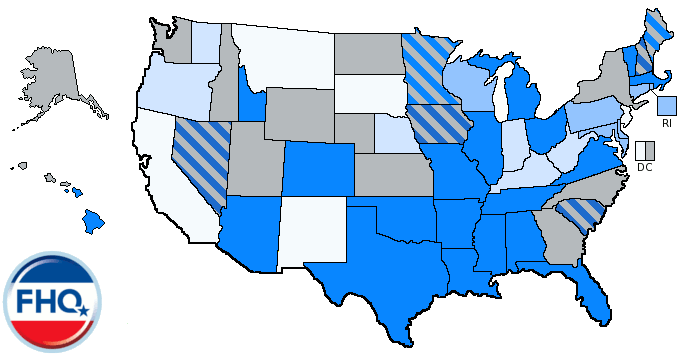 However, once all of Carson's 7 "earned" spots to the national convention were filled by delegates pledged to him, those remaining Carson-aligned national delegates would be bound to the (other) candidates who had 1) earned delegates from the preference vote at the caucuses and 2) were still in the race. If, for instance, Trump was the only other candidate still in the nomination race by the time of the (typically) late spring state convention, some Carson-aligned delegates would fill Trump's allocated slots, but the others would either be bound to Carson or unbound -- because the other candidates had dropped out -- but free to support Carson on the first ballot at the convention. This is a long way -- through this probably exaggerated exercise -- of saying that the Nevada delegates will be bound to candidates on the first ballot regardless of the candidate that delegate may prefer. There are some caveats to add to the discussion, though. One, as alluded to above, is that if candidates drop their delegates can become unbound. Can. Those delegates becoming unbound depends, however, on the candidate to whom they are bound not only exiting the race but releasing those delegates as well. But that is just one option available to such a candidate. The candidate who has suspended their campaign can also choose to hold on to those delegates or can opt before the state convention to have them proportionally reallocated to the candidates still in the race. Opting to reallocate those earned delegate slots would mean choosing to ensure that all of a withdrawn candidate's delegates are bound to the remaining candidates as opposed to, say, deciding that all of those delegates become unbound and then support Carson (as is consistent with the hypothetical above where Carson dominates the delegate election process). The withdrawn candidate can choose to have their delegates bound rather than releasing them to support someone the withdrawn candidate does not prefer. How would this reallocation work? Well, let's assume that Trump after having won Nevada later chooses to withdraw from the race after performing poorly in the states that follow on the primary calendar. But he chooses to reallocate those delegates rather than yield them all to Carson in an unbound situation (again, assuming that Carson has overrun the delegate election process). This is perhaps a bit of a stretch: to assume that the Nevada winner drops out but some of the other candidates below him there stay in the race. Still, it illustrates how delegates would be reallocated. In practice, this is more likely than not a move to allow all of delegates to be reallocated and bound to the one remaining candidate in the race; the presumptive nominee.4 As noted above, though, there is some gamesmanship to this reallocation provision of the Nevada rules if there is not a presumptive nominee by the time of the Nevada state convention. A candidate must receive at least 3.33% of the preference vote. That is the vote share required to receive exactly one delegate. A candidate must receive at least 1.67% of the preference vote. That is the vote share required to round up to one delegate. The allocation instructions do include guidance detailing the rounding of fractional delegates to the nearest whole number. Threshold aside, this is a discussion about the minimum vote share to qualify for one delegate. The odds are high that such a candidate will not be around when delegates are selected and assigned at the subsequent state convention anyway. Regardless, the literal meaning would seem to preclude option #2 above. 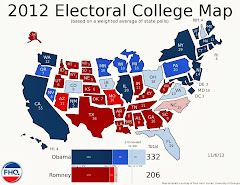 2 The Democratic National Committee added both Nevada and South Carolina to the cast of early state contests in 2006. 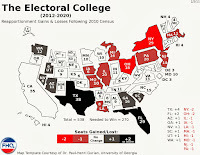 With South Carolina at that point already a part of the group with Iowa and New Hampshire within the Republican nomination process, Nevada Republicans forced the issue and scheduled early caucuses to coincide with their Democratic counterparts for 2008. 3 This poll is being used as an example of how delegates could be allocated under these new rules in Nevada and not as a forecast of the outcome in the Silver state caucuses. 4 In the event that a candidate wins all of the Nevada delegates in such a scenario, the state party chairperson becomes unbound in order for the delegation not to violate RNC Rule 38. This is part thirteen of a series of posts that will examine the Republican delegate allocation rules by state. The main goal of this exercise is to assess the rules for 2016 -- especially relative to 2012 -- in order to gauge the potential impact the changes to the rules along the winner-take-all/proportionality spectrum may have on the race for the Republican nomination. For this cycle the RNC recalibrated its rules, cutting the proportionality window in half (March 1-14), but tightening its definition of proportionality as well. While those alterations will trigger subtle changes in reaction at the state level, other rules changes -- particularly the new binding requirement placed on state parties -- will be more noticeable. There are only so many ways to allocate 16 delegates in a state with just one congressional district. Four years ago, Vermont Republicans met the less onerous RNC proportionality requirement by allocating its (11) at-large delegates in a proportionate manner to candidates with more than 20% of the vote statewide. The congressional district delegates (and automatic delegates -- 6 delegates total) were allocated in a winner-take-all fashion to the statewide winner as was allowed (considered proportional overall) in 2012. The winner-take-all part of the 2012 Vermont delegate selection plan is not consistent with the changes the RNC has made to the national delegate selection rules for 2016; the stricter definition of proportionality. And that necessitated some form of change on the state level in a number of states. Rather than continue to make a distinction between the types of delegates and how they are allocated, for 2016, Green Mountain state Republicans have opted to pool all 16 delegates and allocate them proportionally based on the statewide vote. And really, that was their only play if they were to comply with RNC rules given the March 1 presidential primary date. There are not multiple congressional districts in Vermont, and thus the single district vote is the statewide vote. As such, that synchronicity between state and district eliminates the ability to separately and proportionally allocate two different types of delegates (at-large and congressional district). For Vermont, then, there is no real meaningful distinction for the purposes of allocation. They are all just delegates. The Vermont rules on 2016 delegate allocation set the bar for qualifying for delegates at 20% of the statewide vote. Candidates above that threshold are eligible for a share of the 16 delegates. Those below are left out. Importantly, though, there are triggers that would make Vermont a winner-take-all state. A candidate who receives more than 50% of the vote would be entitled to all 16 Vermont delegates. The usual field size caveats apply. The larger the field of candidates is on March 1, the less likely it is that one candidate will approach the 50% vote share mark. As the field is winnowed, however, that likelihood increases. Additionally, there are scenarios where a crowded field might also force a winner-take-all allocation in Vermont. That happens in the situation in which only one candidate surpasses the 20% threshold. If there is only one candidate north of 20% then that candidate would -- like the candidate over 50% -- claim all of the Republican delegates from the Green Mountain state. There is nothing in the Vermont rules prohibiting such a backdoor winner-take-all allocation, and furthermore there are no detailed description of the "one candidate over 20%" contingency. What the rules do lay out are plans for a situation in which no candidate receives more than 20% of the Vermont primary vote. In the event that no candidate is over 20%, the threshold drops to 15%. If no candidate is over 15% the threshold is lowered to 10%. Different states have dealt with this "no candidate over the minimum qualification threshold" differently. Some states, like Texas, define a specific number of (top) candidates to receive delegates if no one reaches the threshold. Others, like Tennessee (with its statewide, at-large delegates) or Minnesota, eliminate the minimum threshold altogether in the event that no candidate is above the threshold. Vermont, though, is like Georgia (with its statewide, at-large delegates). Both have created a graduated threshold that decreases incrementally, but still maintains a minimum qualifying threshold. That moving target has implications. The cut points in the graduated threshold are somewhat arbitrary, and that has a decided impact on how delegates are ultimately allocated. If the winner finished at 15.1% and the runner-up was at 14.9%, the Vermont threshold would decrease to 15% and the winner would take all of the delegates despite winning only narrowly. And that is a different result than if the threshold dropped to 10% initially. In that case, the runner-up would claim some delegates. FHQ understands the obvious counter to this: "Well, we're only talking about 16 delegates here." Absolutely, but a 16-0 delegate advantage is a lot better than a 9-7 edge and that is even more true when discussing states with a larger delegate cache. The point to all of this is that the moving target threshold is not without potentially significant ramifications. Compared to 2012, the allocation under 2016 rules would shift one delegate away from Romney's total and add it to Paul's. A minor change at best. That, however, is more a function of Vermont's small number of delegates than anything else. As the delegation size increases, so, too, does the impact. All 16 Vermont Republican delegates are bound through the first ballot at the national convention according to the provisions of Rule 11.i of the state party bylaws. The release process entails a delegate being freed if their candidate does not have their name placed in nomination at the national convention or if their candidate has suspended their campaign or withdrawn from the race. 1 Vermont Republicans had 17 delegates in 2012 and has subsequently lost a bonus delegate for 2016, dropping their total to 16. 2 Again, this is a simulation of the impact of the Vermont rules for 2016. Note also, that this simulation will be done using the 17 delegates from 2012. That will allow a better comparison of the impact of the rules. 3 The total sums to more than 100% because the percentages were rounded to the nearest whole number. The allocation is based on the full, voted-based percentage. 4 The Vermont rules also account for an under-allocation. Should, after rounding, there be an allocation of fewer delegates than are available, the unallocated delegate(s) are awarded to the top vote-getter. This is part twelve of a series of posts that will examine the Republican delegate allocation rules by state. The main goal of this exercise is to assess the rules for 2016 -- especially relative to 2012 -- in order to gauge the potential impact the changes to the rules along the winner-take-all/proportionality spectrum may have on the race for the Republican nomination. For this cycle the RNC recalibrated its rules, cutting the proportionality window in half (March 1-14), but tightening its definition of proportionality as well. While those alterations will trigger subtle changes in reaction at the state level, other rules changes -- particularly the new binding requirement placed on state parties -- will be more noticeable. FHQ has discussed to some extent the Republican Party of Texas delegate allocation rules for 2016 already. However, there have been some tweaks made to the rules that have a fairly decided bearing on how Texas delegates will be allocated to candidates based on the results of the March 1 primary. Initially, the Texas GOP attempted to devise a primary-caucus plan roughly similar to the one Texas Democrats have utilized for years.1 That plan entailed raiding the pool of at-large delegates -- those allocated based on the statewide presidential primary results -- and granting the power of allocation to the state convention. It was a clever bid to get two bites at the apple in a wide open presidential primary season. Candidates would come in to the Lone Star state once for the primary and those still around and active in the nomination contest for the June state convention would return to woo the state convention and its delegates. In the end, what this amounts to is a Texas delegate allocation plan that is one step less complicated without the allocation of 38 at-large delegates (one-quarter of the total number of delegates) at the state convention. But it also means that those 38 delegates will not be hanging out there as a potential June wildcard -- the intent behind the creation -- as primary season winds down. The addition and then subtraction of the state convention portion of the allocation plan constitutes a change since 2012, but it will not ultimately be implemented for the 2016 cycle. Still, there are some changes to the current method as compared to how the state party handled its 2012 delegate allocation. Redistricting challenges in the courts held the 2012 Texas primary date (and thus the eventual delegate allocation) hostage into March 2012. That back and forth had the Texas primary in March before considering an April date and then ending up on the last Tuesday in May. When the rules were made for the 2012 cycle, Texas Republicans were planning for a March primary and thus settled on a unique proportional allocation plan. Basically, Texas Republicans proportionally allocated all of their at-large and congressional district delegates based on the statewide results in the primary. It was all one big pool of delegates. However, only candidates who were above 20% of the vote within a congressional district were eligible for a share of the pool designated congressional district delegates. The plan was probably overly and unnecessarily complicated, but it essentially worked out to a small bonus for those candidate who did well. For 2016 and a March primary within the proportionality window, Texas Republicans scrapped the 2012 plan and adopted a proportional plan that is more comparable to some of its SEC primary neighbors (see Alabama or Georgia, for example). As opposed to proportionally allocating a larger pool of at-large and congressional district delegates based on the statewide primary results (oversimplification, but see above), Texas Republicans will have a more unit-specific allocation. The at-large and automatic delegates will be proportionally allocated and bound based on the statewide primary results, but the congressional district delegates, unlike 2012, will be fully allocated according to the results within each of the 36 Texas congressional districts. While the Texas Republican delegate allocation plan is proportional, it meets that mark, but with provisions that potentially limit the number of candidates who qualify for delegates or provide a statewide or district winner to be allocated a disproportionate share of the delegates from those units. Texas Republicans have kind of followed the letter of the law in laying out thresholds that go up to the RNC designated limits. That means candidates must hit 20% of the vote in a congressional district or statewide to be eligible for delegates, but if a candidate wins a majority in either unit, then that candidate is entitled to all the delegates either statewide or in a congressional district. Contingent upon how many candidates clear the thresholds, there are a number of different directions in which the allocation can go. The limits of that statewide are clear. There can only be so many candidates beyond the 20% threshold. Four or fewer candidates will split those 47 at-large and automatic delegates. Unlike some of its SEC primary compatriots, Texas prohibits the backdoor winner-take-all scenario, where just one candidate breaks the 20% mark. Should only one candidate clear 20% statewide, that would trigger a top two allocation. The statewide winner and runner-up would be proportionally allocated a share of the at-large delegates (regardless of whether the runner-up is over 20%). Compared to others, then, Texas limits how much of a boost a winner can get out of the allocation. If no one crosses the 20% threshold statewide, then the allocation is proportional and functions as if there is no threshold. That would open the allocation up to all candidates. However, as has been the case elsewhere, this becomes less and less likely as the size of the field decreases (even with a threshold as high as the one in Texas). At the congressional district level there are still more contingencies. And, they, too, narrow the possibilities of who qualifies for those three delegates. In the situation where no candidate wins a majority in a congressional district, then the top two candidates -- provided at least one is over 20% in the district -- win the delegates. The winner is allocated two delegates and the runner-up claims the remaining delegate. If no candidate tops 20% in a congressional district, then the top three finishers each receive one delegate. What is clear about the Texas plan, at least as compared some others -- is how limited the advantage is to the winner(s). The only way for a winner to put some real distance between him- or herself in the Texas delegate count is to win majorities or pluralities consistently across all congressional districts. That may or may not occur. This is exacerbated by the lack of backdoor winner-take-all provisions. This set of rules tends to greatly reduce the number of candidates who qualify for delegates, but also is likely to produce a pretty tightly clustered delegate count. Here is where being the winner -- or more precisely the order of finish -- matters: rounding. The allocation occurs sequentially from the top down. Any fractional delegate rounds up, even if it is just a tiny fraction. How tiny? Well, Trump and Cruz basically tied in this poll. One more respondent favored Trump than Cruz. Trump could have a .01 fraction and still round up. This problem is mitigated to some extent by the fact that there is an odd number of delegates. Even in a one vote difference situation, Trump would always round up to one more delegate. Rules matter. In this case, rounding rules matter. No other candidate surpasses 20%, and they end up with nothing to show for it in the hypothetical at-large and automatic delegate count. If, as we have done with other states, we extend the above statewide "results" to the congressional district level, that small advantage Trump has -- one vote/respondent -- yields a sizable delegate advantage. When two candidates are over 20% at the congressional district level, the top finisher receives two delegates and the runner-up one. That is true even if that win is by just one vote. As FHQ has stated before, it is difficult to proportionally allocate three congressional district delegates. The Texas Republican delegates to the national convention in Cleveland are bound to candidates based on the results of the primary on at least the first ballot at that convention unless they have been released by the candidate. For those who have not been released prior to or at the convention (but before the roll call vote), they are bound through two ballots. The exception is for delegates bound to candidates who fail to meet a 20% viability threshold on the first ballot. They are released for the second ballot vote. After a second inconclusive ballot all delegates are free from their binds. Most states examined thus far have a one ballot hold on delegates bound to candidate still in the race. Texas, however, keeps delegates bound to those with 20% or more support through two inconclusive ballots. 1 Long allowed by the DNC to be grandfathered into the future, the Texas Democratic primary-caucus (two step) process was rejected by the national party for the 2016 cycle. All of the Texas Democratic Party delegates will be allocated based on the results of the presidential preference primary and that contest alone. 2 That letter is appended to the current rules of the Republican Party of Texas. 3 This poll is being used as an example of how delegates could be allocated and not as a forecast of the outcome in the Lone Star state presidential primary. 4 Though Trump and Cruz both garnered 27% support in this poll, 163 respondents favored the New York businessman to 162 respondents for the junior Texas senator. This is part eleven of a series of posts that will examine the Republican delegate allocation rules by state. The main goal of this exercise is to assess the rules for 2016 -- especially relative to 2012 -- in order to gauge the potential impact the changes to the rules along the winner-take-all/proportionality spectrum may have on the race for the Republican nomination. For this cycle the RNC recalibrated its rules, cutting the proportionality window in half (March 1-14), but tightening its definition of proportionality as well. While those alterations will trigger subtle changes in reaction at the state level, other rules changes -- particularly the new binding requirement placed on state parties -- will be more noticeable. The Tennessee Republican Party method of delegate allocation echoes that of Oklahoma in many respects. In several others, it does not. The biggest similarity between Tennessee and Oklahoma in terms of their respective delegate selection plans is that Volunteer state Republicans were similarly overly proportional given the 2012 RNC rules. Again, four years ago, states could achieve proportionality by simply proportionally allocating their at-large delegates. State parties were free to adopt plans for 2012 that would accomplish that while still allocating congressional district delegates in a winner-take-all fashion. Both Tennessee and Oklahoma awarded both at-large and congressional district delegates in a proportionate manner in 2012. With nearly the same sets of state-level rules carrying over from 2012 to 2016, both states were already in line with the new, tighter definition of proportionality the RNC has for 2016. Thus, there are no real changes to those rules in either Oklahoma or Tennessee. Tennessee Republicans have the highest allowable threshold under RNC rules to qualify for delegates statewide and at the congressional district level. In the vast majority of scenarios, to be awarded delegates, a candidate must win at least 20% of the vote. The only exception is if no one finishes over 20%. If no candidate clears the 20% hurdle statewide, then the delegates are allocated in proportion to the candidates share of the statewide vote. In other words, if no one hits 20%, the Tennessee primary will basically operate as if there is no threshold. If no candidate receives 20% of the vote in a congressional district, then the top 3 finishers each receive one delegate. But as FHQ has stated before, March 1 -- the date on which the Tennessee presidential primary will be held -- the race will have wended its way through the carve-out states and some likely winnowing of the field of candidates. As the field decreases in size, the likelihood of no candidate getting to 20% of the vote in Tennessee (or anywhere else for that matter) decreases as well. The rules change, however, if more than one candidate exceeds 20% of the vote. If multiple candidates are over 20% statewide, then the delegates would be allocated to those candidates in proportion to their share of the over 20% vote (the total share of just those over 20%). Should that happen at the congressional district level, the top finisher would be allocated two delegates and the district runner-up would take the remaining one. Finally, there are a couple of winner-take-all situations. But it should be noted that it is a unit-specific winner-take-all, not a truly winner-take-all allocation.1 If only one candidate crests over 20% either statewide or at the congressional district level, then that candidate would win all of the at-large and automatic delegates or congressional district delegates. As in Oklahoma and several other states, there is a backdoor to a modified winner-take-all allocation and with a much lower threshold. There is also a supermajority threshold for winning all of the delegates as well. If there is more than one candidate over 20% -- again, either statewide or in a congressional district -- and the winner has more than two-thirds of the vote, then that candidate would also lay claim to all of the at-large and automatic delegates or congressional district delegates. Obviously, though, that is a much higher winner-take-all trigger (but lower than the similar threshold in Minnesota). Needless to say, there are a number of contingencies packaged around these various thresholds. The supermajority trigger seems unlikely to be tripped if the field is large, but even as it -- the field of candidates -- shrinks, the other options, including the backdoor winner-take-all route all would be probable. First off, no one is over 67%, so there is no winner-take-all allocation. There is also more than one candidate over 20%, and that means that there is no backdoor winner-take-all allocation. Out of the 6 candidates, only two cleared the barrier and nearly evenly split the 31 at-large and automatic delegates. Trump would be allocated 17 delegates in this scenario and Carson would take 14. If we extend the hypothetical statewide numbers above to the congressional district level, it would trigger a top two allocation. If multiple candidates are over 20%, then the district winner -- hypothetically Trump here -- is allocated two delegates while the runner-up wins the other of the three congressional district delegates. In both the statewide and congressional district allocation simulations, the results would have been no different if the threshold was lowered to, say, 15%. If it was lower still -- set at 10%, for instance -- then Cruz and Rubio would qualify for at-large delegates. Neither would win any congressional district delegates. The 1-1-1 allocation of the three congressional district delegates is only triggered if no one is above the 20% threshold. Like Oklahoma, it is not entirely clear how long or how many ballots the bind lasts for Tennessee delegates. That has a lot to do with how the delegates are selected. The at-large delegates are selected in a couple of different ways. Half of them (14 delegates) are elected directly, listed with candidate affiliation on the primary ballot. The other 14 at-large delegates are selected by the Tennessee Republican Party Executive Committee and with input from the candidates' campaigns. In both cases, those delegates are loyal to their candidate. If that candidate has withdrawn, then those delegates presumably become unbound (or can opt out of attending the convention, in which case the Executive Committee fills the vacancy). The district delegates also appear on the ballot affiliated with (and bond to) the candidate to whom they have pledged. The same rationale applies to them as is the case with the elected at-large delegates. Update: The three automatic delegates (see above) are bound on the first ballot at the convention, according to Brent Leatherwood, the Executive Director of the Tennessee Republican Party (citing RNC rules). Mr. Leatherwood later tweaked this, indicating a change in TNGOP rules meant the three automatic delegates as well as the rest of the delegation would be bound through two ballots. 1 By unit specific FHQ means the winner-take-all allocation is confined to either just the at-large delegates based on the statewide results or just the congressional district delegates based on the results in the several congressional districts. A candidate would have to claim victory by a wide margin in Tennessee to win all 58 delegates. 2 This poll is being used as an example of how delegates could be allocated and not as a forecast of the outcome in the Volunteer state presidential primary. One of the more controversial rules changes that came out of the 2012 Republican National Convention in Tampa was the change to Rule 40. This is basically the guide to getting a candidate's name placed in nomination; to be able to take part in the roll call vote. Over the years the thresholds have gradually increased. In 2012, a candidate had to control a plurality of a delegation from at least five states in order to be nominated. But that is not a bar that had been in place forever. And again, it was certainly a barrier that increased to that level over time. In Tampa in 2012, however, the thought process was a bit different than it is today. There and then, the rules changes were designed with one thing in mind: protecting President Romney in a 2016 bid at re-nomination. As I told Matt Viser a couple of weeks ago, few were sitting around in the Rules Committee meeting the week before the convention or later in the convention room itself thinking about the possibility of 15 candidates vying for the 2016 nomination. The rules that Republican lawyer, Ben Ginsberg pushed through the Rules Committee and were ultimately adopted at the convention protected hypothetical future President Romney in several ways, but one of them was increasing the thresholds a candidate had to meet to have their name placed in nomination at the convention. Instead of the five states a candidate had to win in 2012, a candidate had to win at least eight in 2016. And adding to that, a candidate could no longer skirt by with just plurality control of the the delegation. The rules adopted in Tampa for 2016 upped that to a majority. The raising of the number of states is not really of much consequence. But bumping that control threshold up from just one more delegate than your next nearest competitor to having to control half of the delegates in a state's delegation plus one is a potentially significant change. The impact of the change is minimized when one considers a scenario in which a President Romney is facing off against just one likely fringe foe. Yet, when one removes a hypothetical sitting president and inserts more than 10 candidates with no frontrunner/a nominal frontrunner/an unproven outsider frontrunner, then that change to Rule 40 really seems to start to matter. This is exactly the type of unintended consequences a party gets when it makes plans for a nomination and convention four years ahead of time. Things change and in ways that are difficult to plan for so far out. Well, what do these changes portend for 2016? It is pretty ominous, right? And that is seemingly even more true given a wild and unpredictable field of candidates. As David Byler explains at Real Clear Politics, Rule 40 is basically a placeholder. It was among the series of convention rules that the Republican National Convention (via the adopted Rules Committee package) extended to the next cycle with some tweaks as it routinely does without much notice every four years. And by "convention rules", FHQ means the rules that are intended to govern the next convention (Rules 26-42). Those are distinct from what one might call "primary rules" -- Rules 13-25 -- in one important respect: The convention rules cannot be altered between conventions (see Rule 12), but the primary rules can. That is why we have seen the cleaning up of Rule 16(a)(2) and the reinsertion of shall for may resurrecting the proportionality requirement in Rule 16(c)(2) among other changes. But Rule 40 and the other convention rules have been off limits, static since Tampa. The routine is that these convention rules stay the same. One convention passes them on to another and that next convention adopts them as the procedures for governing itself with no problems. Ultimately though, the convention of delegates has the final say so in that instance. While it is customary for one convention to adopt the rules passed on to it by a previous convention it does not have to. Basically, a convention is charged with adopting the rules that will govern itself. The RNC has streamlined this process, as described above, but the convention can take it off that track if necessary. That is where the discussion of Rule 40 stands now for the 2016 cycle. Again, with a wide open race and a robust field of candidates, the requirements to place a candidates name in nomination at the Cleveland convention appear rather steep. Can a candidate reach majority control of delegations from multiple states? Can multiple candidates get there? Will none get there? We do not have answers to those questions at this point and may not until well after voting has begun in February. But all the while, the RNC -- and ultimately the convention itself -- could have some say in this matter. 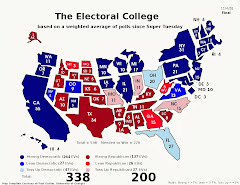 One of the shortcomings of Byler's otherwise excellent piece at RCP is that it does not consider the possibility that Rule 40 works as intended; that only one candidate gets majority control of delegations from at least eight states and receives a majority of the 2470+ delegates available in the Republican presidential nomination race. And there is no defined point in time in which it will be clear that Rule 40 is working (or not). Until then, Rule 40 and the thresholds for nomination contained therein matter. It is a goal for which all the viable campaigns are shooting. There a reason Ted Cruz's campaign (among others) has been involved in Guam. It counts as one of those eight states. The campaigns, then, are operating as if the provisions of Rule 40 are a thing; that it matters. And indeed it does. Getting to majority control of eight states is still a goal for the campaigns until it is not. So, if Rule 40 operates as envisioned, then there is no reason for the convention to change it. In the meantime, though, between now and the convention, the rule puts in place a marker that the campaigns must hit and are in fact striving for. That is different than saying Rule 40 "won't affect the primary outcome". It won't affect the outcome if it ends up standing in the way of the Cleveland convention completing part of its task: nominating a presidential candidate. If Rule 40 does serve as an impediment to that task, then it will be altered. But until it is clear that Rule 40 is a problem -- that the primary process has produced an inconclusive result in part because of the requirements in the rule -- it matters. That does leave us with a couple of important secondary questions. First, does the RNC signaling that Rule 40 is a placeholder now -- in December 2015 -- change how the campaigns approach the process? We will not begin getting an answer to this question until votes start coming in and delegates are allocated. It is at that point that the campaigns will start attempting to frame what they have won and what that means. In other words, do the campaigns keep us updated on the progress they are making toward meeting the thresholds laid out in Rule 40 -- the process of being placed in nomination? Second, if -- and it is still an IF, folks -- Rule 40 is determined to be problematic during the course of primary season (if an inconclusive result is seemingly almost assured), then how does the Convention Rules Committee alter it? Byler addresses at the end of his piece and FHQ disagrees with him. As I said above and as I told Ben Jacobs and Walter Shapiro via Twitter last Thursday when this whole brokered contested convention discussion broke open anew, the number of states required under Rule 40 is not the issue. The biggest, most problematic change was the raising of the control threshold from a simple plurality to a majority. The convention may attempt to game things some with the number of states, but reverting to the former plurality requirement is more likely to solve a whole lot of the potential problems with the Rule 40 requirements. But first thing's first: Let's see if, in fact, Rule 40 is going to be a problem once votes are being cast. The genre can be a bit of a burr under the saddle to FHQ at times, but Philip Bump at least had a nice and pretty thorough brokered contested convention explainer up at The Fix over the weekend.1 I'll resist the urge to dig in too deeply at this point. However, there was one glaring inaccuracy in the write up that should be corrected. Rule 16: If delegates vote for someone besides the candidate to whom they are bound, those votes are thrown out. This is wrong. These votes -- those cast against the delegate bind -- are absolutely not thrown out. If one reads the rule in full it ends up sounding that way by the end of the paragraph. Yet, the key is at the very beginning. The Secretary of the Convention shall faithfully announce and record each delegate’s vote in accordance with the delegate’s obligation under these rules, state law or state party rule. If any delegate bound by these rules, state party rule or state law to vote for a presidential candidate at the national convention demonstrates support under Rule 40 for any person other than the candidate to whom he or she is bound, such support shall not be recognized. Except as provided for by state law or state party rule, no presidential candidate shall have the power to remove a delegate. Bump is picking up on that vote recognition part at the end. But not recognizing a delegate's vote is different than throwing out that vote. In fact, it is impossible to discard a vote that has already been "announce[d] and record[ed]" in "accordance with the delegate's obligation". The order of this is of the utmost importance here. It sets up a sequence: record the bind and ignore the violation of it. For any manner of binding or allocating delegates under these rules, if a delegate (i) casts a vote for a presidential candidate at the national convention inconsistent with the delegate’s obligation under state law or state party rule, (ii) nominates or demonstrates support under Rule No. 40 for a presidential candidate other than the one to whom the delegate is bound or allocated under state law or state party rule, or (iii) fails in some other way to carry out the delegate’s affirmative duty under state law or state party rule to cast a vote at the national convention for a particular presidential candidate, the delegate shall be deemed to have concurrently resigned as a delegate and the delegate’s improper vote or nomination shall be null and void. Thereafter the secretary of the convention shall record the delegate’s vote or nomination in accordance with the delegate’s obligation under state law or state party rule. This subsection does not apply to delegates who are bound to a candidate who has withdrawn his or her candidacy, suspended or terminated his or her campaign, or publicly released his or her delegates. This is the kitchen sink version of the same rule discussed above; the current rule. But notice that even under this rule, the vote is not thrown out, the delegate is. Then the vote is counted as if the delegate had cast it properly and in accordance with the instruction of the binding. Note also that the actions of the rule are flipped. In the early version of the rule the secretary of the convention awaits some violation before correctly recording the vote. The altered, current version completely removes the ability and motivation of a delegate to vote in violation of the binding by reversing the order. But the changed rule to eliminate the resignation of a delegate. But the bottom line here is that in neither case would the vote have been thrown out. That would make an already messy situation -- a contested convention -- even messier. 1 It is not that FHQ does not like the convention discussion. It usually entails a headlong dive into the rules, and I am rarely averse to that. However, we have all been through this before. We are entering into brokered contested convention chatter season, but it ends up being a quadrennial exercise in putting the cart before the horse. There are delegate allocation rules that are going to matter a lot more in the near term than trying to calculate the conditional odds that they -- the rules -- are going produce an inconclusive outcome in June.